Fiber cement is a siding material that was introduced to the market in the 1980’s as a replacement for asbestos cement siding products. It has become common in some parts of the country, offering design versatility and a solid feel. Some fiber cement manufacturers include James Hardie, Nichiha, and Allura. Products like Hardiplank fiber cement siding will require regular painting to maintain their beautiful appearance, unlike other sidings such as brick or insulated vinyl. Some factory-painted siding panels are available, and come with up to 15 year warranties that cover peeling, cracking, and chipping. However, many homeowners find themselves needing to repaint their home sooner, and warranties can be very particular about what is covered. 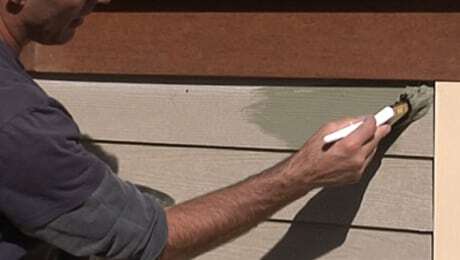 Caulking may also be required to help maintain the warranty and protect against the next problem with fiber cement siding we will cover, moisture absorption. Absorptive claddings like fiber cement can hold moisture, leading to panel damage, rot, and even mold problems. It is critical that all installation steps are very carefully followed by a professional to ensure all penetrations and gaps are properly treated with the appropriate paint or caulk to protect the panels from moisture infiltration. 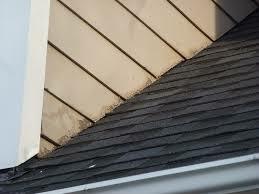 Close attention must be paid to all required gap clearances between rooflines and decks during installation, to not put fiber cement in continued contact with more moisture. Any violation of the instructions can create serious moisture concerns and void the product warranty. A third party study by Home Innovations Research Labs spanning the course of over a year shows that fiber cement retained less moisture than products like stucco and manufactured stone, but performed worse than brick, vinyl siding, and insulated vinyl siding. In addition to religiously following installation instructions to avoid moisture concerns, installers must also take special steps to protect their health when installing fiber cement. Cutting fiber cement siding generates respirable crystalline silica, a known human carcinogen. Inhaling too much silica can lead to silicosis, lung cancer, and COPD. Visit www.silica-safe.org for more information. Special saw blades, ventilation, and respirators can be used to limit silica inhalation to a safe level during installation. Fiber cement can also be brittle before being installed on the wall. Care must be taken to properly store panels, which generally require two people to carry and install. Attention must be paid to the types of nails and guns used to prevent blowouts at the point of fastening on the panel. Some people believe that fiber cement is environmentally friendly because it is made from items like cement, fibers, or fly ash. However, the process to produce fiber cement requires the use of a lot of utilities, and the weight of the finished product makes shipping harder on the environment. 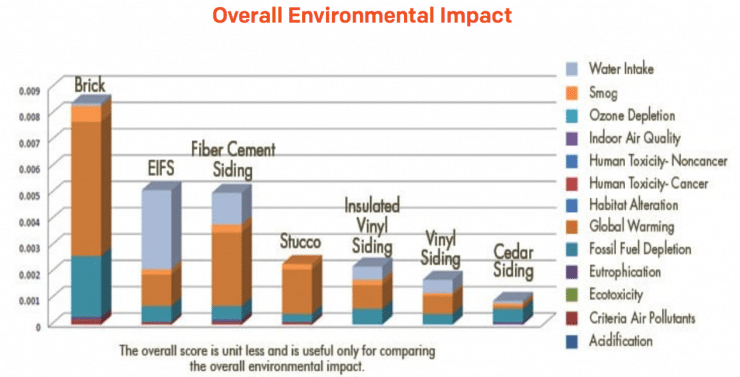 A third-party Life Cycle Assessment shows the overall environmental impact of fiber cement to be worse than real cedar siding, stucco, vinyl siding, and insulated vinyl siding, particularly in areas of global warming potential and water intake. Fiber cement is a cementitious product, therefore it serves as a bridge for energy loss, compared to other more energy-efficient siding products. 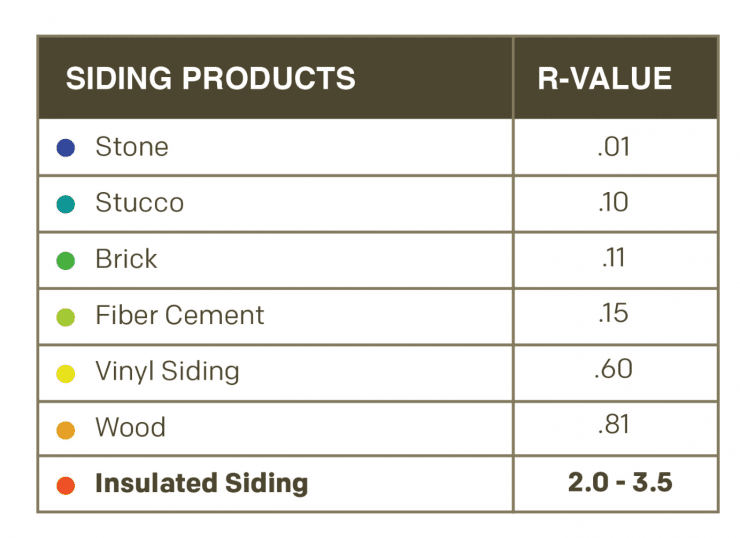 According to Table 5-1 of the ASHRAE Fundamentals Handbook, fiber cement has an r-value of .15, better than brick and stone, but lower than vinyl at R-.60, wood at R-.81, and insulated vinyl siding at R-2.0 - 3.5. The American Society of Heating, Refrigerating, and Air-Conditioning Engineers (ASHRAE), is the leading source on design and construction related to heating, cooling, and energy efficiency. Houses with fiber cement siding can be insulated by adding a layer of energy-saving foam underneath. However, this creates a second step in the install process, and sometimes special steps must be taken if the foam is thicker than the siding manufacturer recommendations. 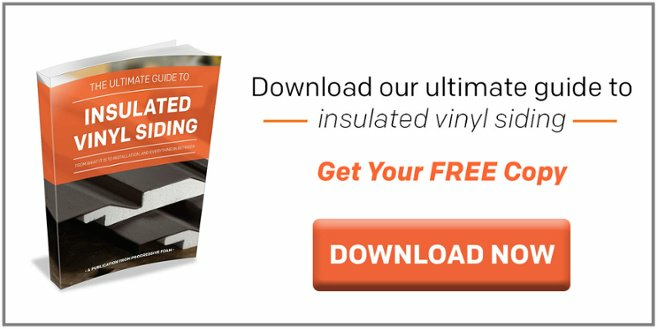 Alternative products like insulated vinyl siding add insulation and siding in one step, for an easier, more cost-effective installation. Read more about insulated vinyl siding vs. fiber cement. Fiber cement is a common siding product that can improve the appearance of a home, but it also has some disadvantages compared to other products available today. 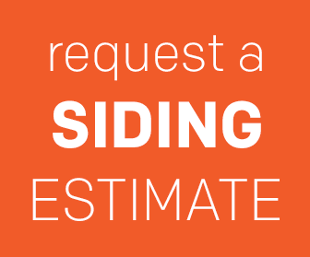 Before investing in new siding, it’s critical to determine which characteristics are important for your particular project.